You’re probably familiar with this soup’s cousin – potato leek soup. Potato leek soup is a tasty, creamy and hearty soup that is perfect for late fall days when you want a heavy, stick to your ribs type of meal. 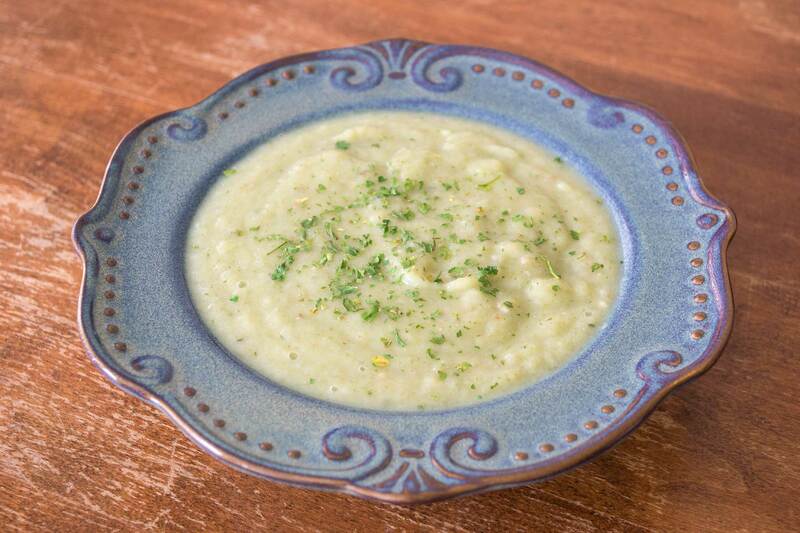 Cauliflower leek soup is a lighter soup, perfect for when you want the creaminess and comfort food feel of potato leek soup, but without the heaviness of potatoes. 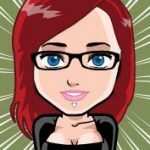 And bonus, it’s dairy free! 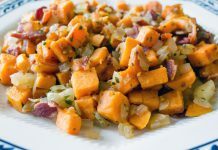 I’ve reworked my old version of this recipe to add a bit more brightness to the flavors. The parsley in this version adds a bit of a vibrant element, perking it up without taking away from the comfort food feel of the soup. I really love this new version. I keep snacking on the leftovers in the fridge! 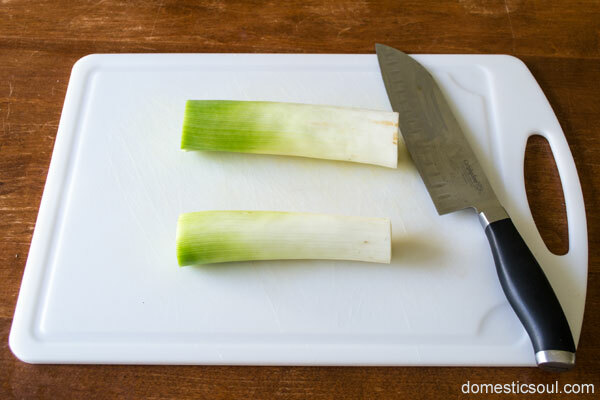 Prep: Slice and clean the leeks. 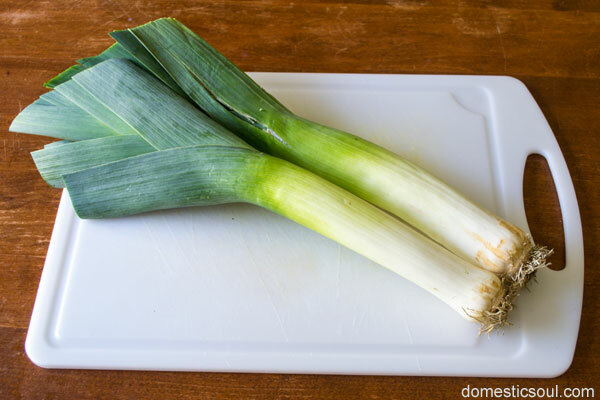 Like onions, leeks have many layers to them. Unlike onions, leeks can get dirt and sand stuck between the layers while they grow. 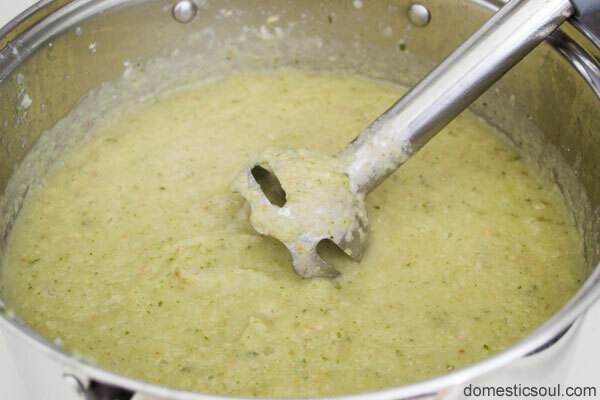 To make sure your soup doesn’t get sandy, here’s how to clean them. Now, you’re ready to start cooking. 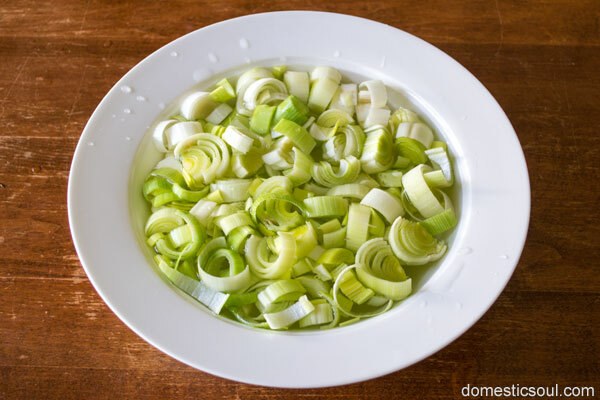 I usually leave the leeks soaking until it’s time to use them in the recipe, then I scoop them out with a slotted spoon to add them to the pan. Step 1: Chop 4 slices of bacon and cook them in a pan over medium/medium-low heat until the pieces are cooked through, but not burned. Step 2: Once the bacon is fully cooked, add the sliced leeks. Stir the leeks around a bit so they get covered in bacon fat. Cook for a few minutes until the leeks soften a bit. 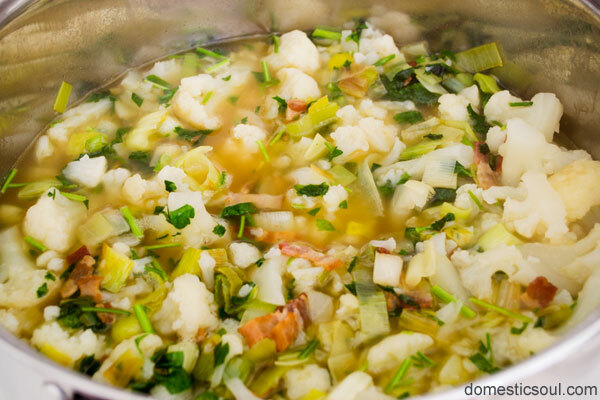 Step 3: Once the leeks are softened, add 1 cup chopped fresh parsley. Stir to combine. 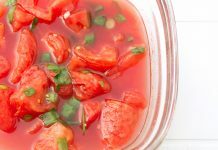 Cook another 5 minutes to blend the flavors, then remove from heat and set aside. 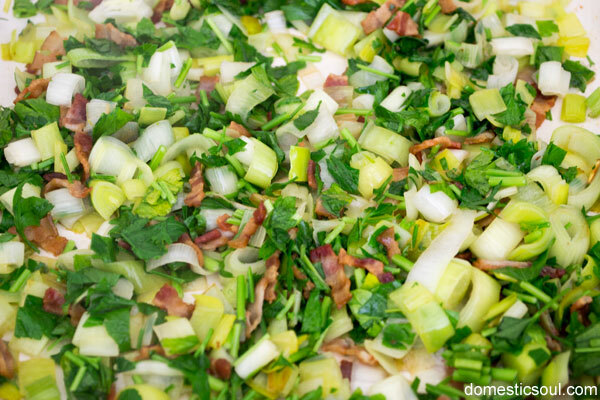 Step 5: Add the bacon/leek/parsley mixture and 1/2 tsp thyme. Mix to combine. Cover and cook 10 more minutes. Step 6: Break out your super amazing stick blender and blend the soup. Step 7: Salt to taste. Serve and enjoy! 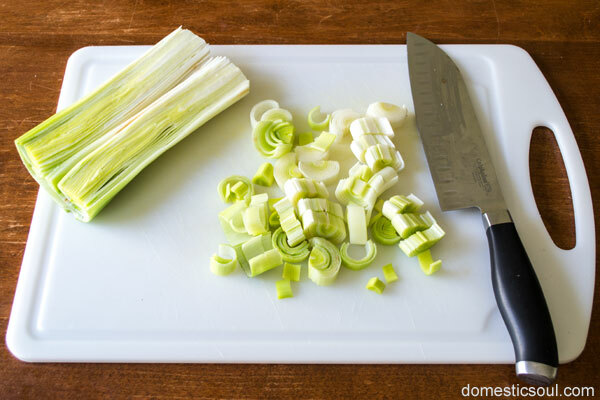 Slice and clean the leeks: Chop off the dark green part at the top and the roots at the ends. You should be left with just the white and light green parts. 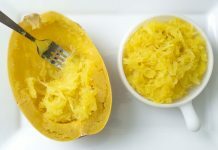 Slice each piece in half lengthwise, then chop slices across so you are left with small pieces. Then, soak the pieces in water for a few minutes. Give them a bit of a stir to agitate them a little and loosen up any dirt or sand stuck between the pieces. 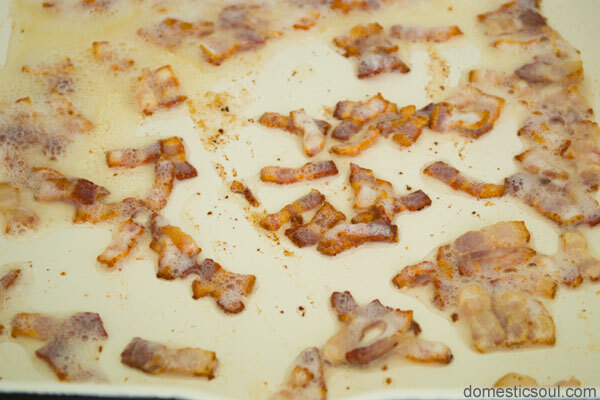 Chop 4 slices of bacon and cook them in a pan over medium/medium-low heat until the pieces are cooked through, but not burned. 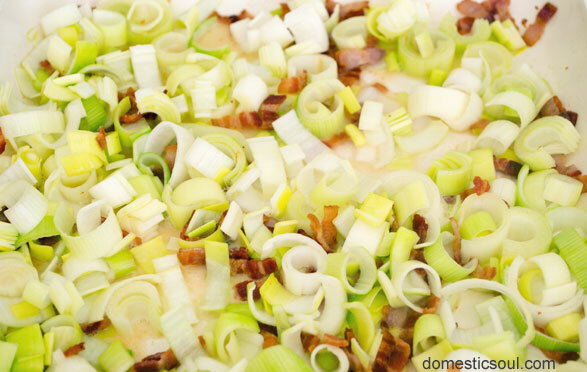 Once the bacon is fully cooked, add the sliced leeks. Stir the leeks around a bit so they get covered in bacon fat. Cook for a few minutes until the leeks soften a bit. 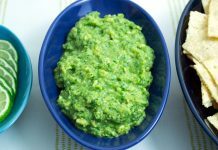 Once the leeks are softened, add 1 cup chopped fresh parsley. Stir to combine. Cook another 5 minutes to blend the flavors, then remove from heat and set aside. 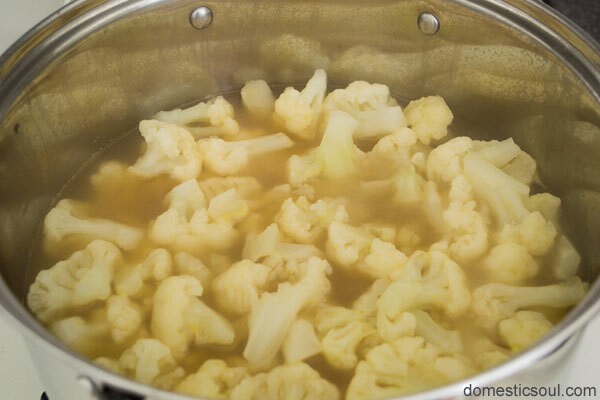 In a small stock pot, add both bags of cauliflower and 4 cups chicken broth. Cover and bring to a boil. 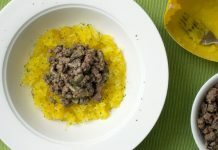 Once boiling, turn down to a simmer and cook for about 10 minutes – until you can easily break the cauliflower apart with a fork. Add the bacon/leek/parsley mixture and 1/2 tsp thyme. Mix to combine. Cover and cook 10 more minutes. Break out your super amazing stick blender and blend the soup. Salt to taste. Serve and enjoy!